The Nigerian Army in a face saving mechanism have once again lied through their teeth in denying that no member of the Indigenous People of Biafra, IPOB, was executed by its murderous operatives during their pro-Trump rally at Igweocha, Rivers state. The unprofessional Nigerian army while debunking claims by the IPOB spokesperson, Comrade Emma Powerful that it killed 11 Indigenous People Of Biafra (IPOB) who peacefully rallied in solidarity to the inauguration of the US President, Donald Trump, as false and malicious which only “existed in the figment of his imagination”, forgot that they earlier admitted killing only one Biafran and not as reported during a visit to their station in Igweocha. Many eyewitnesses during the assault on IPOB members, attested to the fact that agents of the Nigerian army in conjunction with the police did not only fired teargas on innocent citizens but also shot, manhandled and injured several orders of whom were still receiving treatment at various hospitals today. The result of the use of excessive force and inhumane brutality on peaceful Biafrans are self-evident on the pictorial and live videos captured while they were unleashing mayhem on these innocent souls yet they still have the effrontery to utter such devious lies on the graves of innocent ones. The Nigerian police in Igweocha cannot deny the fact that in a meeting they held during the visit of a certain lawyer on behalf of those arrested, one of them admitted in front of the DPO of that station and in presence of the lawyer(without recognizing him as he was on mufti), that the security forces actually killed some unarmed and innocent Biafrans on 20th January. According to the lawyer who relayed the information, “they were having a serious meeting with their DPO and other top Policemen at their station when I came in respect of those detained after the rally. “One of them, without realizing that I am a lawyer because I was dressed on mufti, admitted to my hearing that it was when they started hurling stones that they opened fire on them and killed a number of them at the spot. “They also brought out two big baskets full of Biafra, Israel and US flags, all soaked with blood of which they Commander ordered them to dispose the flags. 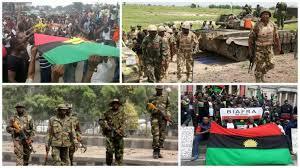 So why would in spite of all these, the Nigerian army instead of accepting responsibility for their unprofessional disposition will be accusing IPOB for trying to blackmail them as if they had ever told the truth ever since they started massacring innocent Biafrans since Buhari's regime. Hardly will the Nigerian security forces especially the Army admit unprofessionalism and brutal waste of innocent lives in any of their operations or in the handling of sensitive and delicate matters. They also kill and deny; will try every possible means to exonerate or defend their culpability in crimes against humanity even in the presence of abundance evidence. It is no longer news that some of the Biafra agitators including a 20 year old Ndubueze Okolie, Justice Uwakwe and a couple of other deceased victims of pro-Trump rally was murdered in cold blood by Nigerian military. Such wicked and irresponsible denial by these alien forces would only amount to sheer ignorance and utter disrespect to the graves of these innocent souls. We are asking the Nigerian army whose cruel and callous activities having been indicted by the International community and human rights organizations on several occasions to go and learn the sane and professional measures deployed by security forces of the western world in crowd-control, protests and/or rallies and also learn how to accept responsibilities for their actions. Chukwu Okike Abiama would surely avenge this destardly act against unarmed peaceful Biafrans. It is a matter of time. The world still turning a blind eye at this evil. No government on this planet will deny that they don't have the knowledge of these atrocities going on in Nigeria.